Jovan Armand, Ian Chen, Zachary Levi, Jack Dylan Grazer, Faithe Herman, and Grace Fulton star in Shazam. These days, superhero movies need a little something extra to make them stand out from the pack. They can’t just be a typical, big-budget, flashy action movie. There needs to be a certain level of humor, pathos, or some poignant commentary that takes the film to the next level. 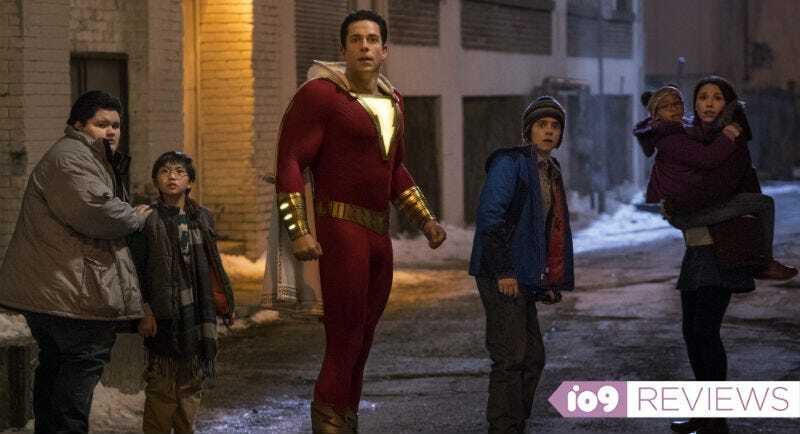 In the case of David F. Sandberg’s new DC movie Shazam, that’s exactly what happens, by hiding a movie about the power and importance of foster families inside a sometimes-silly superhero origin story. Shazam and Freddy pound some sodas. Shazam and Sivana show down. Now that’s a superhero image. There are a few hiccups along the way but Shazam is undoubtedly another win for DC. It never quite reaches the bombastic heights of Aquaman or sheer gravitas of Wonder Woman but it’s got heart enough for all three, a good balance of humor and action, and near infinite potential for the future. I have no idea how this innocent, lovable boy ends up fitting into a larger DC universe but it’s going to be really exciting to find out. He’s a star.